This dog cradle folds flat so that you can keep it in the car at all times. 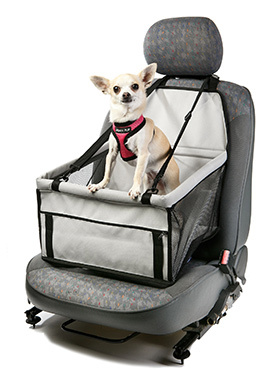 It takes minutes to attach to any seat and features an integral safety strap that will clip onto any dog harness to keep your dog safe and secure throughout the journey. The cradle features support bars around the three sides demonstrated by the dog standing on one of them. Your dog will be able to sit down or stand up to take in the view. Or if they prefer they can also lie down for a quick snooze, keeping them happy and contented while letting you concentrate on the road ahead.